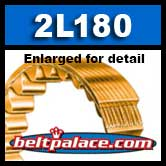 2L180 FHP V-Belt. 1/4” W x 18” Overall Length. High strength Bando Duraflex GL polyurethane 2L180. TWO LEFT IN STOCK. ORDER NOW!